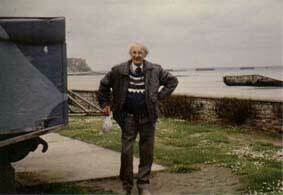 Some of Francis Edgar Oxby's experience's of D-Day recorded by his son Keith F D Oxby. Lt. Francis Edgar Oxby RM - 1942 Many thanks to Keith Oxby for taking the time and trouble to compile this information and to allow others to read it. Only by recording the experiences of veterans TODAY can we ensure that these memories are not lost forever. If you or any relation has not recorded their wartime experiances (however 'normal' you think they may be) please take the time to do so. These memories will be treasured, not only by people today, but particularly by future generations. This is dedicated to my father, Francis Edgar Oxby who was born on the 1st March 1912 in Nottingham England. He was everything a son could want in a father, and it came as something of a surprise when I found that he had been very actively involved in the greatest sea borne invasion of all time. Dad was the second son of a Nottingham Master Decorator, and he later followed his father into the family business, which he ran for the next fifty five years. He married Ruth Mary Bailey on the 22nd August 1936 and fathered two girls and two boys, myself being the youngest. As the stormy days of the Second World War approached, my Dad was busy learning the decorating trade and courting Ruth. He was an active member of the church choir and spent much of his free time cycling around the Nottinghamshire countryside. In 1939 when Prime Minster Chamberlain's "peace in our time" became worthless, and when his country called him, he willingly accepted his enlistment in the Royal Marines. His early days were spent in Plymouth and Thurlestone on the south coast of Devon, where he learned to become a Marine. Having been recognised early as a potential officer, he was soon selected and eventually became a Lieutenant. He was posted to an amphibious unit, which handled landing craft, and Dad was soon involved in training a squadron of Landing Craft Personnel (LCP). Whenever he could he would correspond with Ruth, and on rare occasions would take his leave in Nottingham. These periods in Nottingham were very important to him because he knew that Ruth was working hard to raise two girls without the help of a husband. He would try to complete all those jobs which were building up, and help dig the garden for planting vegetables, which were in short supply. As 1944 approached and the Allies began to anticipate an amphibious landing in Europe, he spent more and more time preparing his unit for the inevitable landings. 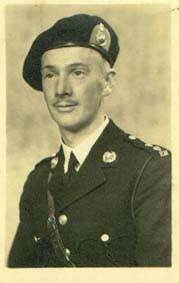 Being in charge of a squadron of LCPs he knew that he would be called upon to deliver troops onto the beach during the first wave of landings. Like all those men embarking on the landings, Dad was given a small amount of 'Invasion money" and strangely enough, a contraceptive! Being a resourceful man, and happily married, Dad used the contraceptive in the only way he understood. He improvised it as a waterproof container, in which to house his invasion money, some cigarettes, matches and his wrist watch. 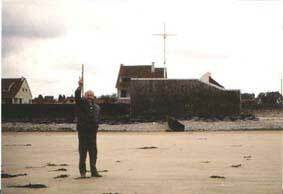 His squadron was selected to land troops on to Gold beach, near the little French sea-side town on Bernieres-sur-Mer. Aerial view taken by a US airplane Early in 1944 Frogman had photographed the beaches and those pictures gave him the location of the landing site, and also an indication of what was in store for him. The Germans had been preparing for just such an invasion, and the beach had been fortified with numerous hazards, including railway lines in the form of a cross, which had also been mined. These obstacles were designed to rip the bottom out of just such craft as Dad was commanding for the assault. 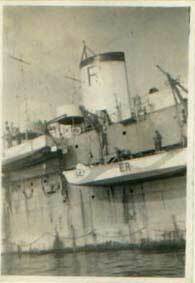 HMSL Rapier On the morning of Tuesday 6th June 1944 the armada approached the beaches in heavy seas. There had been a bad storm for many days, and although there was now a break in the weather, the seas were still high. The skies were clearing as Dad prepared to leave the relative safety of his mother ship, HMSL Rapier. As he had anticipated, he was to be part of the first wave, and due to reach his objective at 0720 hours. The approach to the beach was extremely difficult, with the heavy seas exacting a toll on the already seasick troops. His objective was to land on a section of beach in front of a German Pillbox, which fortunately was designed to enfilade the beach either side of his landing. It was therefore important that the landing craft arrive at the exact spot or the chance of casualties would be far greater. 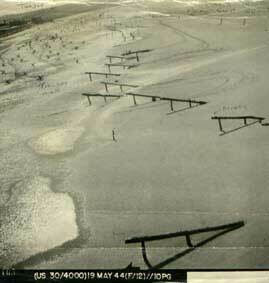 The obstacles were compounded by the shell craters from the earlier shelling from the Allied ships. His six landing craft arrived on the beach under heavy fire from the German defenders, and were able to deposit their precious cargo of troops intact. Having completed this landing, his craft negotiated the pounding surf to return to HMSL Rapier for a second load. During the ensuing forty eight hours, my Dad made thirty four such landings, without losing one man, although there was one occasion when an Army officer gave him a scare. As his craft made the approach a second time, it grounded far earlier than it had previously, and the impetuous officer assumed that they had reached the beach. Before Dad could back off and negotiate the crater the officer decided to take the initiative. Fortunately his order of "follow me men" was not complied with as swiftly, because when he jumped from the ramp, fully loaded with his equipment of war, he disappeared into the shell crater whose edge had caused the early grounding. Swift action by Dad and the officer's men returned him to the LCP where he quickly composed himself before launching himself onto the beach a second time. Dad said he never saw this officer again, and often wondered what happened to him. Two days after the landings, Dad managed to find time to write to his wife and let her know he had come through in good shape. The letter was one of a number which I inherited, and the contents are yet another incite into this wonderful man. Once again I write you since the great day last Tuesday. I do this in case you did not get my first letter and of course secondly to keep your letterbox going "rat a tat tat". After weeks of hard work and some very tiring experiences, we are enjoying some well deserved respite, waiting in case we are required elsewhere at this early stage. If you received my yesterdays letter I am sure you would be very proud to know I was amongst the first to start the ball rolling and come back after great success. I didn't lose one craft or a man. You were told in the papers and over the air, that the sea was like a Mill Pond, I only wish the originator of this had been in my craft, he would have thought differently! I was continually wetted every inch of the way back, but this was simply grand when I thought of the soldiers who had just started their day! After all I had a "home" to get back to. My darling, as I said to each ship (by signal) we passed close too, "THE DAY WENT WELL" for us, and I am highly satisfied that I could not have fulfilled my role more fully. When we reached the ship, her sides were lined with the Merchant Marine, Royal Navy and a few Royal Marines who cheered us as we came alongside. We had not finished though, we had yet to be hoisted and when you think of 10 to 15 tons being hoisted in a pitching sea of waves sometimes 12 feet high running alongside the ship and thrashing us about like a piece of cork, you can imagine my chagrin at the account of a "Mill Pond"! We are now ploughing our way back towards home and one cannot help but think of all the good this EFFORT could be giving to the people of this world instead of the death and destruction that goes with war. The sea is lovely and a clear green, swelling only in the ship's wake, a light haze lies over the horizon blending sea and sky into one. I try to visualise you and I going on such a trip together, not a care in the world and new sights and sounds to experience, one grand, well earned holiday. Thank you darling for being with me in thought at a time when I needed your help so much. The experience was, on looking back, rotten during the hours that preceded the operation. One wondered what would happen and what ones reaction would be to eventualities, but when actually "on the job" so to speak, it was not so bad, as one had plenty to occupy ones time. I am pleased to hear you have managed to get some tomato plants and put them in. I do hope they make good darling. 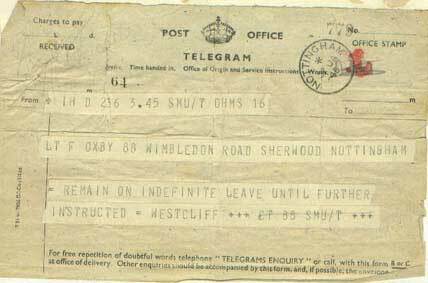 Demob Telegram When the Allies had successfully completed the landings in June 1944 and were commencing their advance on Berlin, my Dad returned to Britain to await orders. As sections of occupied Europe were taken back by the Allies, and the push to Berlin began in earnest, Dad was sent to the northern German city of Kiel in October 1944. He remained there until July 1945 when he was returned to Britain prior to demobilisation. On the 1st November 1945 he was granted three months compassionate leave to return home to Ruth, who now had three children to deal with. His first son, Michael had been born in July 1945. In the years that followed the end of the Second World War, Dad went on to father a second son, me, and become head of the family decorating business. He eventually became President of the Nottingham Builders Federation, and achieved his dream of building a house in the Nottinghamshire countryside. He also took on a new pastime, painting, which would occupy much of his time in the later retirement years. Retirement came in 1986 and Dad used every moment that now came his way to best effect. He taught art at a nearby Borstal, and later at the local Primary school, where his marvelous relationship with children came to the fore. He and Ruth spent much of their time producing a garden that rivaled some of the Ornamental Gardens that they loved to visit. They also spent as much time as possible in traveling the world, particularly Europe, where Dad's choir would often hold concerts. During all the years I knew and loved him, Dad would hardly mention those difficult days of 1944 and particularly his involvement in the landings. It was not until almost fifty years later, when I asked him if he would like to visit Normandy that the full realisation of the part he played became apparent. My brother and I spent four days in the company of this splendid man, touring the sites and even standing on the exact spot where that frail little LCP landed its load of precious troops at 0720 on the 6th June 1944. Keith F D Oxby, Missouri USA.